For the first time on 6 September 2017 in Ploiesti, ERGO together with its member Centrul de Resurse pentru Incluziune Sociala CRIS from Romania brought the topic of antigypsyism to the local level. 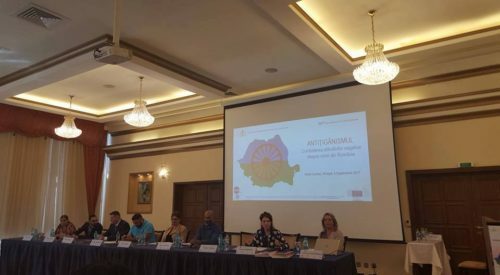 Among the speakers were the Head of the European Commission’s Roma unit from DG Justice, Szabolcs Schmidt, representatives of the Romanian government and key actors from Romania who work on Roma issues. ERGO’s Director Jamen Gabriela Hrabanova highlighted the importance of bringing up the issue of antigypsism at local level and of supporting institutions to understand its long term effects and its implications. The mayor of the city of Ploiesti committed to reintegrate Roma people in his region. Based on their experiences with working on the CLLD process, trainings with Local Action Group and their engagement at local level Asociatia Cris wrote a comprehensive recommendation paper addressed to the Mayor of Ploiesti with the aim of improving the situation of the local communities Mimiu and Catun. Combatting antigypsyism at the centre of policies. To read the full paper with detailed recommendations from our member please click here. 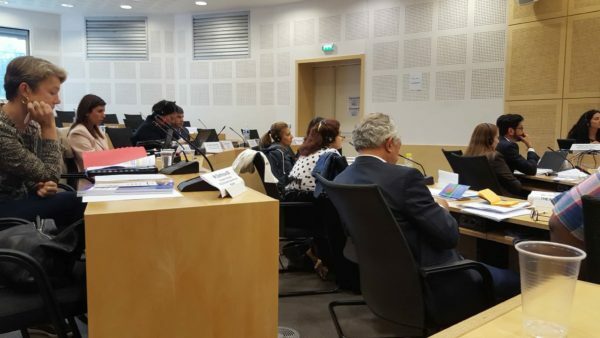 ERGO took part in the 4th Dialog Meeting of the Council of Europe (CoE) with Roma and Traveller civil society from 18-19 Sept 2017 in Strasbourg. Carmen Tanasie presented our research on the Youth Guarantee from 2016 and our current fact-finding work in the field of Roma youth employment. The main topic of the meeting was to find ways to ensure that there is a bridge from education to employment for young Roma and Travellers. Representatives of the Ad hoc Committee of Experts on Roma and Traveller Issues (CAHROM) from different countries, civil servants of the Council of Europe and the European Commission, experts, international organizations such as ILO and about 20 representatives of Roma and Traveller civil society took part in the meeting. For one and a half days the participants discussed initiatives and projects of different organisations and institutions and identified possible solutions to improve the transition of young Roma from education to employment. The participants agreed for example that Roma entrepreneurship is one of the possible solutions to end discrimination and exclusion of Roma on the labour market. The Council of Europe together with the civil society representatives formulated 9 recommendations that are still under revision and will be presented at the upcoming CAHROM meeting in October. ERGO member Autonomia Foundation from Hungary recently published a set of recommendations based on the outcomes of their project “Closer to Communities – Roma Coordinators for better use of EU Funds”, supported by the Rights, Equality and Citizenship Programme of the European Union. The general purpose of the “Closer to Communities” programme was to increase the efficiency of projects benefitting from EU structural funds. The programme was implemented in 15 disadvantaged communities where a large number of Roma live – these communities were assisted by local Roma coordinators in their local development. The Hungarian National Association of Local Authorities (TÖOSZ) participated in the implementation and supported the national dissemination of lessons learnt. ERGO Network contributed to the presentation and dissemination of results at international level. As a result of the programme, 11 applications for Roma integration projects were submitted to EU Calls for Proposals, which will provide close to 1 Million Euro worth of local development funds if supported. Hundreds of local governments were directly informed of the project at the county forums and in workshops organized jointly with TÖOSZ. In addition, dozens of mayors were involved in discussions on Roma integration challenges and possible solutions. The experiences and suggestions of the project were presented at a working group meeting in Brussels with different experts and civil servants of the European Commission in May 2017. The main recommendations focus on better dissemination of good practices, stronger conditionality of European funding, more transparent funding rules as well as more core funding for Roma and pro-Roma NGOs in order to act as independent watchdog organisations. Read more about the project results and recommendations here. As one outcome of the project, local communities took part in common art projects, focusing on community video making. Have a look at the film ‘Closer to Communities’ . In 2011 the European Commission adopted an EU Framework for National Roma Integration Strategies focussing on four key areas: education, employment, healthcare and housing. The Framework invited all Member States to present the European Commission with their strategy for Roma inclusion or for specific policy measures for the Roma within their wider social inclusion policies. The main responsibility as well as the competences to improve the situation of all marginalised people, including the Roma, rest with the Member States. In their midterm review of the EU Framework published in September 2017, the European Commission asks particularly for improvements in the transition from education to employment and confirms ERGO Network’s assessment that in order to achieve more social inclusion, discrimination has to be better tackled: “The growing proportion of young Roma who are not in education, employment or training (NEET) is an alarming signal that translating results in education into employment and other areas requires a more effective fight against discrimination (p.2)”. At the same time, the European Commission collects stakeholders’ views on the achievements and challenges faced during the years of implementation of the EU Framework for National Roma Integration Strategies up to 2020. A public consultation aims to gather views on European and national policy, legal and funding instruments that have been mobilised to fight discrimination and to promote the inclusion of Roma. 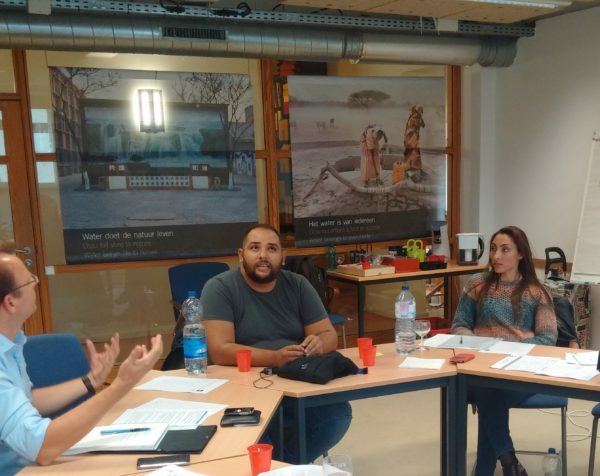 From 20-22 September, ERGO’s members involved in our Annual Work Programme under DG Employment, met in Brussels for their third Roma Civil Society Working Group Meeting. Important issues were on the agenda: The group gave input into ERGO’s work programme on employment and social inclusion for the next four years, evaluated the cooperation of the past years together with an external evaluator and built relations with desk officers of the European Commission Directorate Generals for Employment and Social Affairs and Regional and Urban Policy. 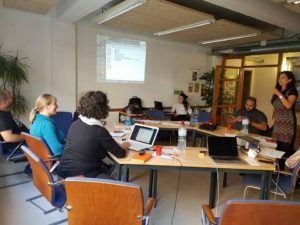 ERGO’s members from Hungary, Bulgaria, Romania, Czech Republic and Slovakia are cooperating with the ERGO Network secretariat in Brussels since 2014 in the framework of the project ‘Roma Included: Roma recognised as equal stakeholders in the policies targeting them’. In 2017, the organisations continue to coordinate national Roma coalitions in their countries, build the capacity of grassroots NGOs and Local Action Groups to benefit from the community-led local development process and take part in a common research project on Roma youth employment. The results of this year’s work will be disseminated by the end of the year. This website has received financial support from the European Union Programme for Employment and Social Innovation EaSI (2014-2020). The information contained in this website does not necessarily reflect the official position of the European Commission.